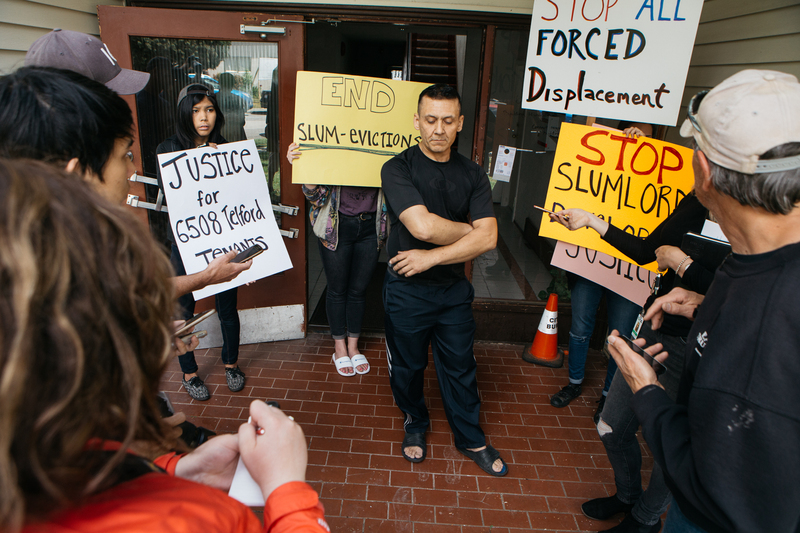 On Monday, May 28th tenants and supporters held a press conference outside their apartment building at 6508 Telford Avenue to denounce their corporate landlord and the City of Burnaby for forcing tenants to live in toxic and dangerous conditions and evicting them under false premises. While the slumlord developer that owns 6508 Telford will profit by refusing to repair their building until they demovict it for a condo tower, the City of Burnaby bears responsibility for organizing both the building’s decay, through their refusal to legislate safe and liveable building conditions, and the building’s eviction, through their “Downtown” Metrotown Plan that gifts developers with density bonuses to replace affordable apartment buildings with luxury highrises. 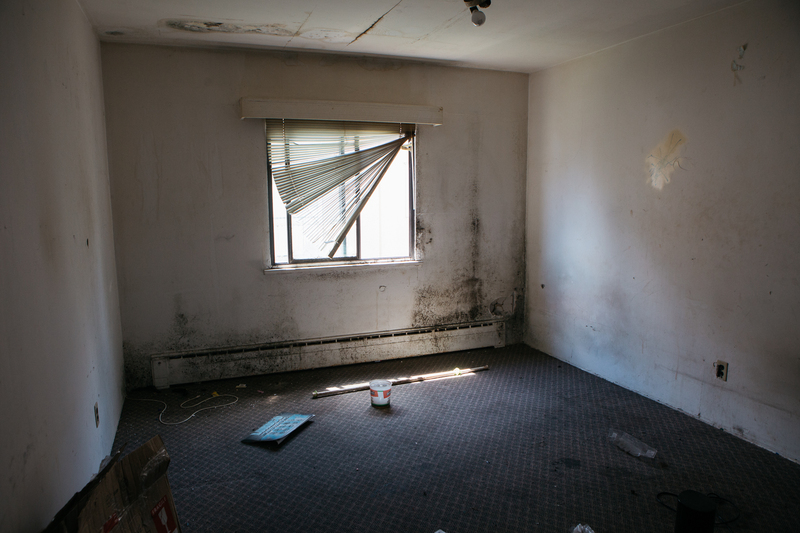 Since buying the building last year, Westland Development has allowed the apartment at 6508 Telford in Metrotown to fall into a state of total disrepair, putting the lives of the tenants at risk. As resident Tom Arabi testified, “There has been no heat for years, the roof is leaking and my apartment is infested with mice and black mold.” This fits a pattern we have seen across Metrotown since Burnaby City Council first developed their Metrotown Downtown Plan. By rezoning the area for condo towers to replace the existing low-rise apartment buildings, Council has rendered the neighbourhood’s affordable rental housing, and the tenants who live there, worthless as far as the market is concerned. Corporate landlords preparing to profit from redevelopment cut costs by refusing to do necessary repairs, knowing that the buildings will soon be torn down, and by not paying tenants full compensation as they are forced to flee deteriorating living conditions. Residents of 6508 Telford Avenue have been living in slum conditions for months. At the May 28th news conference these tenants gave a tour of their building, providing material evidence of their toxic living conditions. Mr. Arabi showed reporters a large hole in his bedroom ceiling around the light fixture caused by water leaking from the roof. “I told the manager many times about it; they sent someone to look at it, but then I never saw anyone else again,” he said. 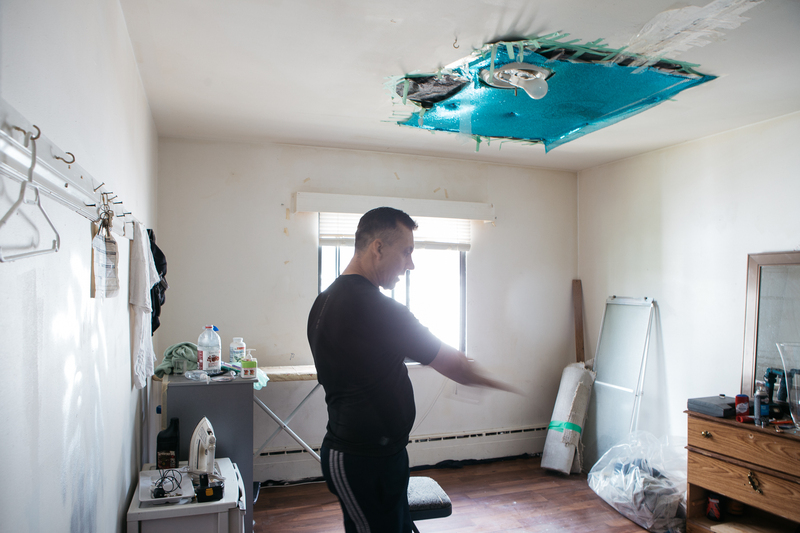 The press toured another apartment, vacated by the tenants only three months ago after receiving an eviction notice, where water leakage had left large holes in the ceiling and black mold was everywhere. The lack of heat in the building has meant the use of electric heaters, sometimes supplied by the landlord. “If we plug two heaters in at the same time, the fuse blows,” says Mr. Arabi, “and when an older tenant left his heater on, it started a fire and he lost everything he owned.” Mail service has also been cancelled for residents here because the mailboxes in the foyer are in a state of disrepair, so tenants have to travel 5 km to a post office not easily accessible by transit to get their mail. This is a particularly pressing problem for tenants relying on income assistance who receive notices through the mail. The immediate responsibility for this state of toxic disrepair lies squarely on the shoulders of the corporate developer. Westland purchased this property in 2017 for $8 million, even though it was assessed at just over $3 million. The condo developers also own the three adjacent buildings north of 6508, a parcel of land poised for massive redevelopment in accordance with the City’s Metrotown Downtown Plan, which includes the most expensive single property purchased in Metrotown in 2017. Westland gave tenants a two month eviction notice in February, ostensibly for major renovations, but the City’s Building Department has no record of renovation permits for this building. The landlord-organized decay of the building points to a structural problem rooted in economic logic: why sink considerable capital into renovating a small 10 unit apartment building on a site marked for large-scale development? The City of Burnaby also carries responsibility for this disaster. 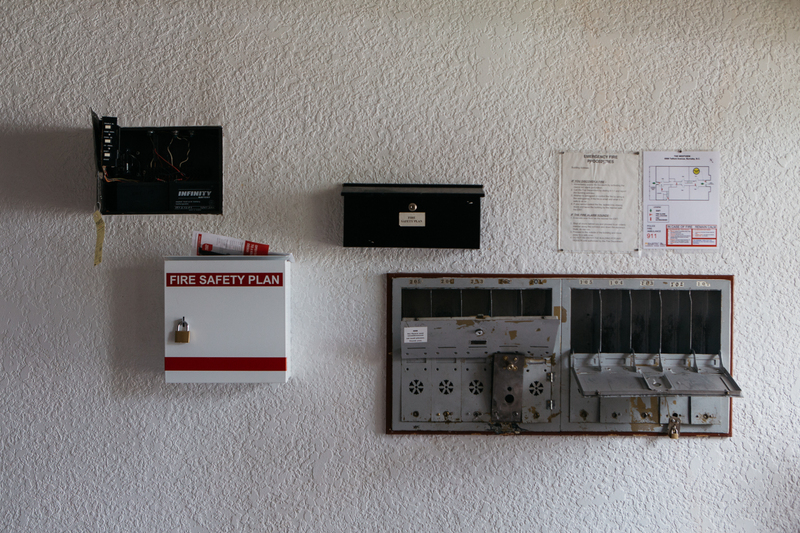 The City has refused community calls to establish a Standards of Maintenance bylaw that would protect tenants from life threatening living conditions by requiring landlords to comply with maintenance obligations in buildings. Currently the City of Burnaby has the power to force property owners to mow their lawns, but refuses the power to force them to repair leaking roofs or broken heaters in an apartment building. This legislation gap pushes the responsibility onto the tenants, forcing them to file complaints through the Residential Tenancy Branch, an onerous process of online applications and documentation filing that low-income and newcomer residents often don’t understand nor have the necessary resources to access. According to Stop Demovictions Burnaby organizer Emily Luba, “Recent BC NDP reforms to the Residential Tenancy Act which give tenants more notice about impending renovictions, or more time to dispute them, or that allow them to return to the renovated unit at market rents, are of no help in these situations and will not stop evictions.” As market forces continue to drive up rents and drive down vacancy rates, tenants will always remain vulnerable to displacement legitimized by colonial legal structures that serve and protect the rights of private property ownership.